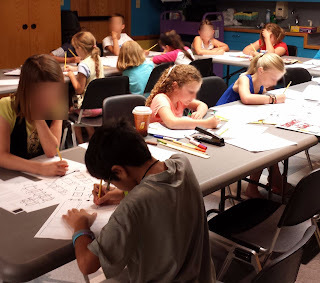 Abby the Librarian: Comic Book Workshop: Guest Post from Ms. Teresa! Today, I am so happy to turn the mic over to one of my awesome librarians, Ms. Teresa. She ran an awesome Comic Book Workshop this summer, which brought in a great crowd of tweens, an age that's been hard for us to reach. 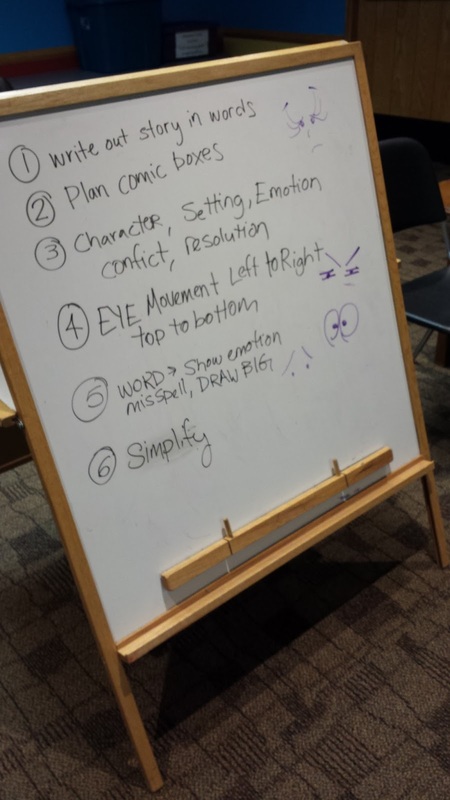 Recently, Bryce posted about a similar program she did at her library: Make a Graphic Novel. I'm excited to share Teresa's take on the same idea! Hi, all! My name is Teresa Scherping, and I have the pleasure of working as a children’s librarian for Abby the Librarian herself. Program planning for the Summer Reading Club can be a challenge. I want something that will get kids in the door, won’t take a ridiculous amount of prep during an already busy time, and will maybe even relate to our theme. Since this summer’s theme is Every Hero Has a Story, I thought that it might be fun to do a program for upper elementary kids about making comic books. A lot of our young patrons love graphic novels, and we also get a lot of requests for drawing books. Plus, an open-ended art program sounded simple, flexible, and creative. I did want someone to provide some sort of instruction at this program and offer tips and pointers about drawing comics or cartoons. Unfortunately, I don’t have any training in art. Fortunately, we’ve formed relationships with local teachers who do! I contacted one of our patrons, a local art teacher who has regularly checked out collections of books from us for her classroom, and she said she’d be happy to help. The afternoon of the program, I set out blank white paper, pencils, rulers, staplers, markers, and crayons on long tables in our small programming room. I also pulled books from our collection on comics and cartoons and spread them around on the tables for inspiration. I had looked through some of the books beforehand and made copies of pages that I thought might be helpful, such as different ways to draw cartoon eyes or a chart of drawing challenges in case kids were stumped. When our teacher arrived, she came prepared with a handout of cartooning basics, an example comic she drew herself, and many pages of blank comic panels that the kids could draw in. She had the kids do a little free drawing while everyone got settled. Then she went over the basics of making a graphic story, like establishing character and setting and expressing exaggerated emotions. She had a lot of great tips! While the kids were working on their comics, she went around and asked each one about their idea and how they were planning to implement it. She was very positive, and you could see the kids opening up and wanting to share. She also encouraged them to share their drawings and ideas with each other to get feedback. She got them talking about comic books or graphic novels they like to read and continued to teach to the whole group as needed. Altogether the program took about 50 minutes, with some engrossed comic artists staying a little longer as I started to clean up. We had 16 kids who seemed to all be in the 3rd-5th grade age range we specified. This was a great turnout for us, especially for this age! I look forward to building off of this success with future programs featuring art or graphic novels. If you’re looking for a low maintenance program for tweens and you know someone with some cartooning knowledge, I highly recommend giving something like this a try.